Learn how and why you should shake things up and broadcast your next live event from a remote location. 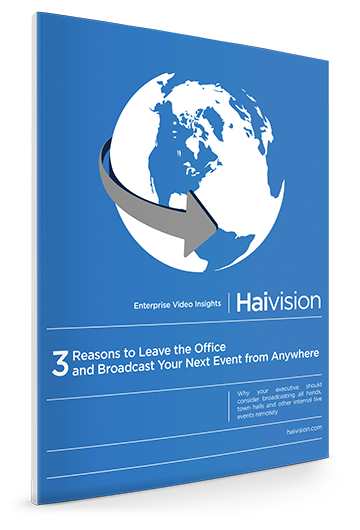 Download this whitepaper for insightful tips, best practices, and learn how Haivision’s Enterprise Media Platform makes it easy to stream secure and reliable internal live events from anywhere. Video is quickly becoming one of the most important trends in the enterprise. Heavily used for employee training and learning, it’s now making its way to the C-level with live broadcasts of company townhalls, CEO addresses and all hands meetings. Did you know that more and more companies are broadcasting events from remote locations, too? Just because your executives travel, doesn’t mean they can’t keep in touch with the company while they are on the road.